The NRC has added two items to the growing list of documents on seismic issues related to the Diablo Canyon Power Plant, near San Luis Obispo, Calif. Our Region IV office in Arlington, Texas, sent the plant operator, PG&E, an inspection report and our headquarters Office of Nuclear Reactor Regulation in Rockville, Md. sent PG&E a letter about the plant’s seismic hazard reevaluation due in March 2015. The Region IV inspection report discusses the agency’s independent assessment of the operability determination completed by PG&E associated with its September report on the Shoreline and other faults near the plant. PG&E provided the report to the state under California Assembly Bill 1632. That bill required the report so the California Energy Commission could assess if California’s largest baseload power plants are vulnerable to a seismic event as those plants age. The NRC did not request this analysis, but PG&E committed to keep us updated on any new information that would indicate the Shoreline fault is more energetic or capable than was presented in the January 2011 Shoreline Fault Report. PG&E further committed to provide the NRC with an interim analysis of any new Shoreline-related information before the post-Fukushima evaluations are due in March 2015. Our regional review of PG&E’s operability determination indicates there is considerable design margin for the plant’s systems, structure, and components. The staff did not identify any concerns with PG&E’s determination that the plant is operable. The analysis adds to the evidence that the plant’s systems, structures, and components would function properly after an earthquake and not pose undue risk to public health and safety. Our letter from headquarters confirms PG&E will incorporate the September report’s findings into its ongoing, post-Fukushima, full seismic re-analysis due in March 2015. The NRC believes this more rigorous analysis will provide the most accurate assessment of faults affecting the site. The bottom line is that the effect of earthquakes has been extensively evaluated during the construction, licensing, and operation of the plant. Diablo Canyon’s systems, structures, and components are designed to withstand the area’s earthquakes and perform their safety functions. PG&E’s conclusion that the faults were bounded by previous studies was based on applying new methods to the data (Chapter 13 of the PG&E report). Since all of these faults have grown since the plant was licensed, these new methods were less conservative that contained in the current license bases. NRC Operability policy (IMC 0326, App C.4), stated that use of less conservative methods (than in the CLB) is not allowed for operability. In fact, C.4 required that PG&E benchmark these new methods against the CLB to insure that safety analysis margin in results is not created. Another example where not even the NRC follows the NRC Rules. “CaptD” Take your nuclear fear-mongering elsewhere. Fukushima proved no such thing. The problems at Fukushima were primarily caused by TEPCO management. TEPCO did not have a strong nuclear safety culture. Management chose to remove most of the bluff at the Fukushima dai-ichi site to reduce operational costs. See the Japan Times, 13 July 2011, “Fukushima plant site originally was a hill safe from tsunami” http://www.japantimes.co.jp/news/2011/07/13/national/fukushima-plant-site-originally-was-a-hill-safe-from-tsunami/ TEPCO management refused to build an adequate seawall, despite being repeatedly advised of the tsunami risk by experts. Insufficient numbers of Fukushima workers conducted practice drills to insure they would take the proper safety actions when a tsunami hit – so they panicked instead. 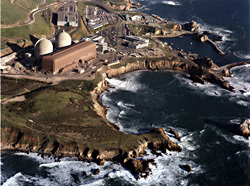 Diablo Canyon sits atop a bluff, with critical safety systems at least 85 feet above sea level. The plant has a strong nuclear safety culture at every level, from high-level corporate officers to plant workers. The workers frequently practice safety drills. The earthquake-inducing faults in the vicinity of the plant are the most heavily studied of any area in the world. The plant is conservatively designed with massive, heavily reinforced concrete walls and very robust metal I-beams. The worst DCPP shaking would be from the Hosgri fault, and the plant would continue to safely operate, with a safety margin, despite being subjected to a worst-case Hosgri fault earthquake. Lateral strike-slip faults, such as those found within a great distance from DCPP do not cause tsunamis like the ones caused by the undersea subduction zone that was at the epicenter of the massive 11 March 2011 earthquake to the east of Japan. Thus, it is very misleading to compare Fukushima dai-ichi to DCPP. Face it, the NRC and PG&E are both just hoping that a really big earthquake and/or Tsunami will not destroy this and/or any other coastal reactor. Fukushima PROVED that Nature can destroy any land based nuclear reactor, any place anytime 24/7 and to think otherwise is unacceptable since each reactor could also cause a Trillion Dollar Eco-Disaster! Just because it has not occurred yet does not indicate it will not happen today or tomorrow! Here is the latest evidence that Diablo Canyon Power Plant is safe. The likely nuclear power opponent response: False claims of regulatory oversight collusion with PG&E.